ONLY A FEW years ago, the Musical Instrument Digital Interface (known as MIDI) made its debut—on keyboard synthesizers. The capability of transmitting complex programming data via a single cable from one instrument to another — regardless of the manufacturer — became a reality. However, it remained a "keyboards-only" feature until just recently. 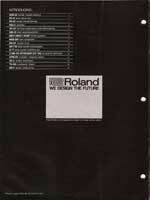 But late last year, MIDI started to cut a fine path into the realm of signal processors; it was incorporated into Roland's ground breaking GR-700 guitar synthesizer, and the SynthAxe (profiled in the Mar. 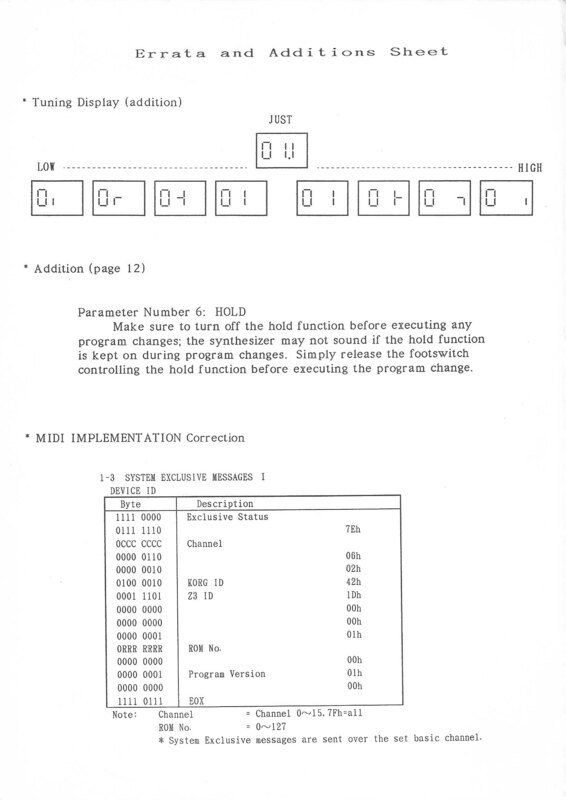 '85 issue of Guitar Player) is devoted solely to creating MIDI signals. Aside from these isolated examples, MIDI gear for guitarists was still entrenched somewhere in the Paleozoic era in early '85. At the National Association of Music Merchants International Music & Sound Expo in New Orleans in late June, the new concept finally bloomed, as MIDI for digital delays, reverbs, distortion and flanging devices, and programmable amps made simultaneous debuts. Steinberger introduced its GL-2/GR and GL-2T/GR guitars ($2,150.00 and $2,450.00, respectively; the latter has a transposing tremolo) with built-in Roland GR-700 electronics (webmaster note: this is incorrect, the electronics have the same features of the G-707/STK-1, though this was a custom circuit board unique to the Steinberger guitars). In addition to the synthesizer hex pickup, each guitar has a pair of EMG pickups. 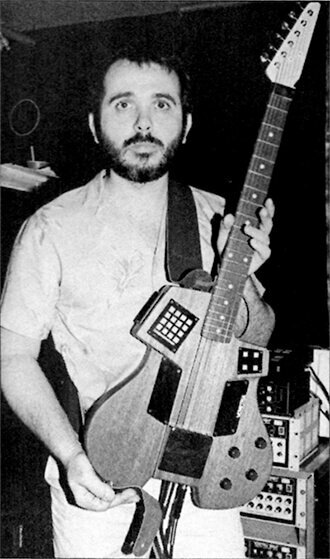 Ibanez showed its Electronic Guitar, a prototype polyphonic MIDI synthesizer controller with an electronic whammy bar and a sleek profile. 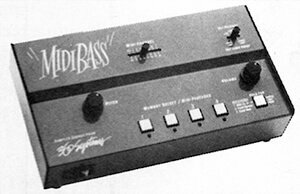 Actual samples of bass guitar sounds — from snapping and picking to bowed acoustic - are stored in the 360 Systems MIDI Bass, which can then be played by connecting the unit to any synthesizer, sequencer, or drum machine with a MIDI connector. What does this mean for guitarists and bassists? Imagine being able to store various programs in a digital delay. Later, when you add a multi-effects unit, you can link the the delay to it with a MIDI cable and a standard audio patch cord, and then be able to recall programs including both units — all without any complex outboard switching unit. And because of this modularity, you can keep expanding: Add a digital reverb, connect it to your programmable amp (no need for channel switching — you can store a bunch of completely different settings and recall any of them at the push of a switch), and maybe slave a drum machine to the whole thing, so that when you play certain notes, drums sync in unison. The possibilities are boggling. Perhaps the most extreme impact is in guitar synthesizers. A guitar that outputs via MIDI can control keyboard synthesizers such as a Yamaha DX7 or a Casio CZ-101 or several units at once. No longer must a player be restricted solely to the sound module (and its inherent timbres) that comes with a synthesizer guitar. Tired of the sounds your keyboard synth makes? Get rid of it, and buy a new one—without having to give up your guitar. 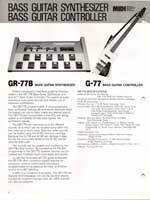 Modeled after Roland's G-707 guitar synthesizer, the G-77 Bass was demonstrated in concerts put on by the manufacturer. 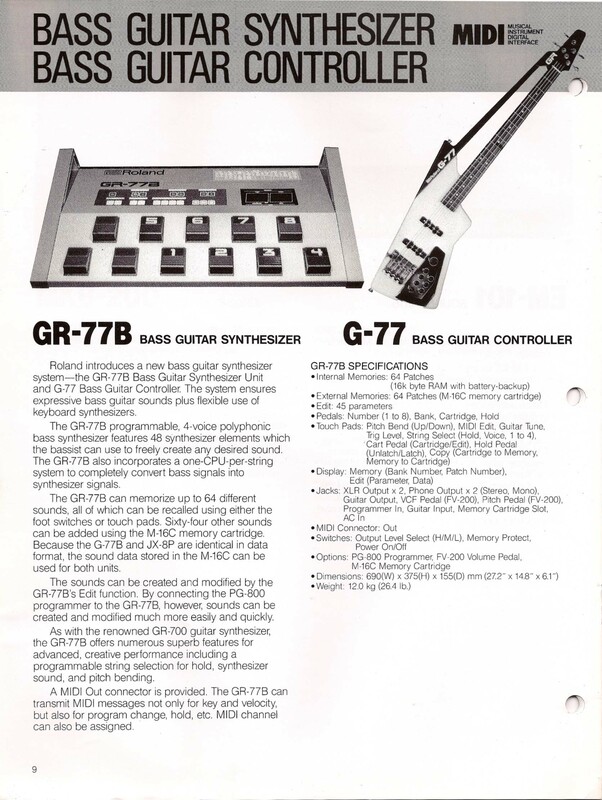 The GR-77B synthesizer unit stores 64 programs and a MIDI output and 10 pedal switches; the instrument has standard pickup outputs as well as synthesizer controls and a 21-fret fingerboard. 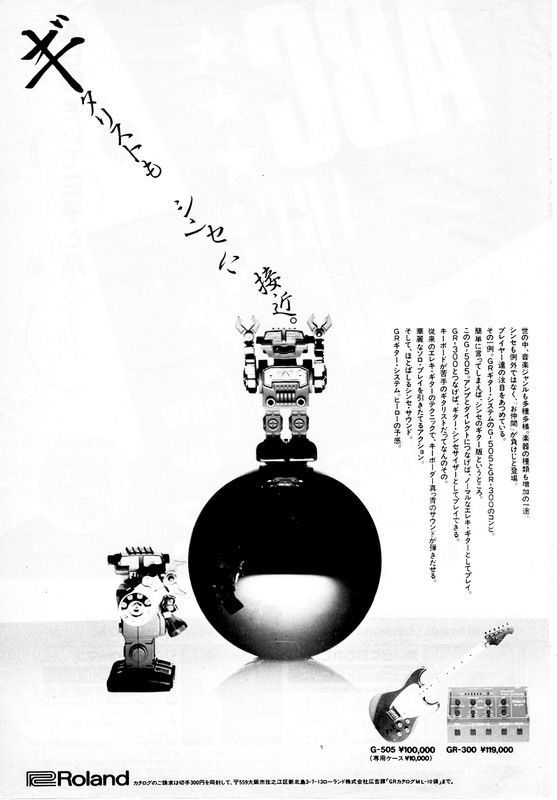 Like its guitar counterpart, it has the stabilizer bar between the headstock and body to reduce spurious vibrations. The 210-watt RMS solid-state model drives a pair of 12" speakers. 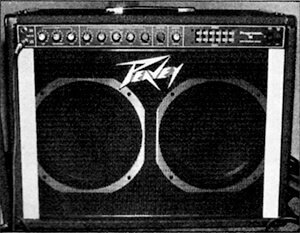 Peavey also introduced its MIDI-addressable Programmable Effects Processor model 4000 which produces delays up to four seconds long and stores 10 programs. To control these and other MIDI devices, Peavey unveiled the RCM 2000 footswitch board. 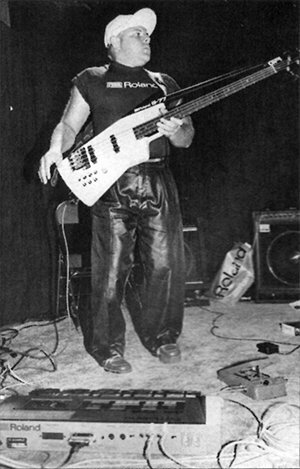 The successful hardware and software company Octave-Plateau Voyetra showed up to the 1985 Summer NAMM show with what may be the rarest MIDI guitar of all time, the Octave-Plateau Voyetra MIDI Guitar. As a software company producing the acclaimed Sequencer Plus sequencing software, Octave-Plateau Voyetra had plenty of programming chops. 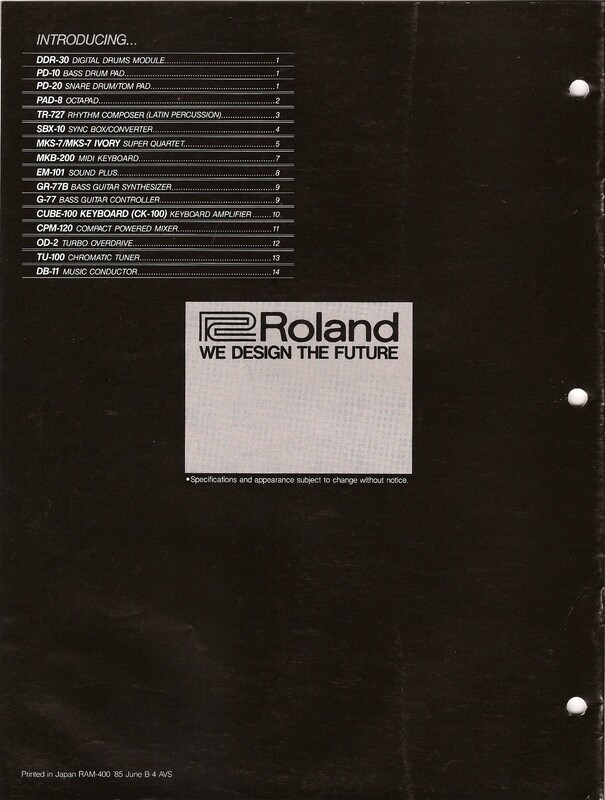 But the company was also responsible for the Voyetra Eight, a cutting edge polyphonic analog synthesier using a serial interface that predated MIDI. Little is known about this MIDI guitar. 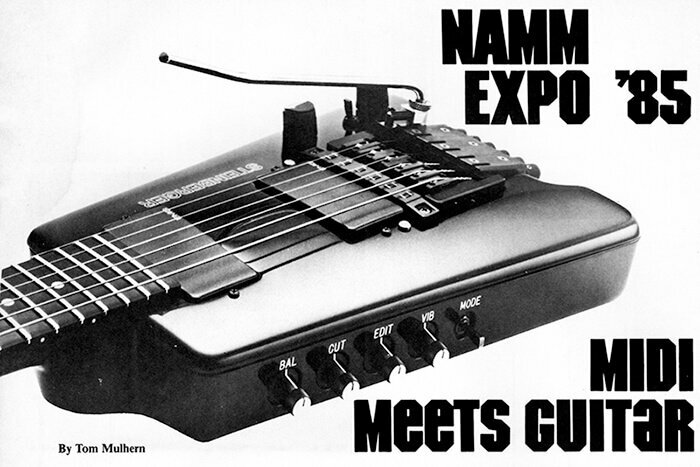 I have only found two references to the guitar, in the issue of Guitar Player Magazine, from September 1985, and in the English music technology magazine, Electronic Soundmaker & Computer Music, also from September of 1985. The Octave-Plateau Voyetra MIDI Guitar (about $2,000.00) is a polyphonic synthesizer controller. It has no sound generating circuitry, but it can link directly to any MIDI-equipped synthesizer. Programs can be recalled via the numerical keypad on its upper bout, and such parameters as vibrato and pitch bending can be programmed into the touch plate/pickguards. Besides putting out a MIDI signal, it has a standard guitar pickup output. Peavey's Programax 10 digitally stores 10 complete front-panel settings, which can be recalled via MIDI or the front-panel switches. A hexaphonic pickup that comes with Cherry Lane Technologies' IVL Pitchrider 7000 guitar-to-MIDI converter ($995.00) can be mounted on any electric guitar. The rack-mountable unit is fully polyphonic. Other Pitchriders include stand-alone and monophonic models. 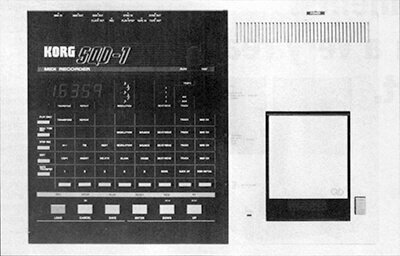 Korg's SQD-I MIDI Recorder uses a 2.8" diskette to store up to 15,000 notes and acts as a 16-channel sequencer. It can be linked to guitar synths and drum machines, and can record two tracks of information. 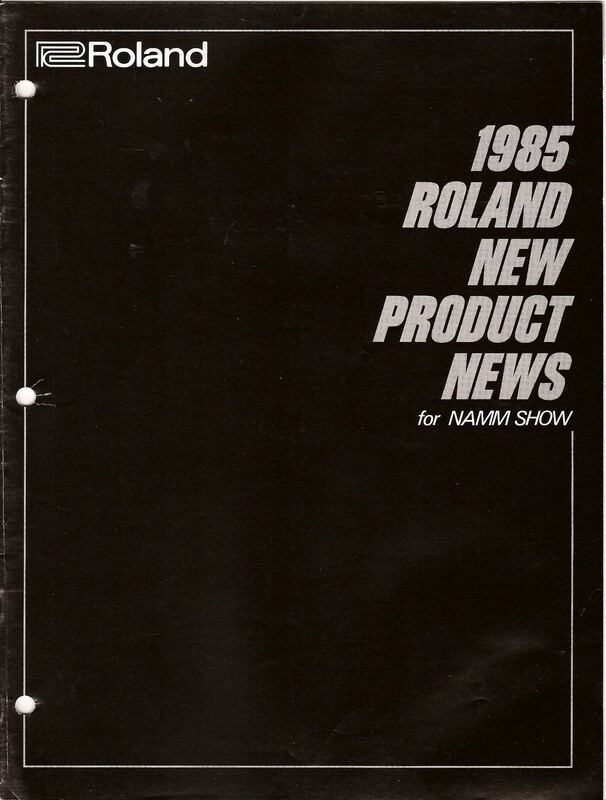 But if you think the NAMM Expo was nothing more than a MIDI showcase, take a look at the following report, as well as next month's installment. The 20,000 or so attendees also previewed advances in 5- and 6- string basses, a bevy of new guitars and signal processors, lots of recording and PA gear, amps of all descriptions, and a maze of accessories. Some list prices aren't shown here, in most cases because they hadn't yet been firmed-up. If you want more information regarding the equipment shown here, write to the manufacturers; addresses are listed in Crosscheck, page 126. Aria introduced its Diamond Jet Series electric guitar and bass, featuring black anodized die-cast machine heads, and maple necks and bodies. The Jet Axe guitar has a bridge-position humbucker and two single-coils, coil-tapping, two tone controls, a master volume, and a 5-position selector. The bass has two pickups, a 3-way selector, one volume, and two tones. Black, metallic silver, and metallic red finishes are offered. 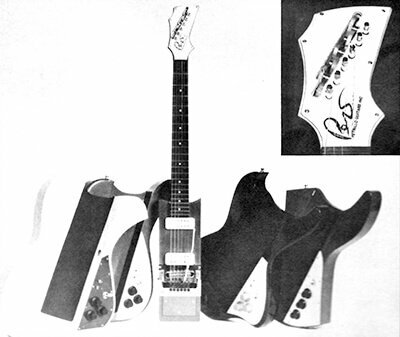 Pennino's West solid body electric guitars come in several forms, including "V" types, offset single-cutaways, and double-cutaways. A variety of pickup and control configurations is offered. Astro Guitars showed some of its custom line, which consists of everything from Strat-style to V-style bodies and a variety of headstock and neck/fingerboard combinations. Pickup types, pickup colors, the finish, tremolo model, and tuning keys are selected by the customer. List price: $1,575.00. Mains Guitars showed several striking guitars and basses with zippers and chains imbedded in their faces. Many had radical graffiti-style paint jobs, and some had rivets and studs. Great Britain's Wal showcased fine handcrafted fretted and fretless basses with laminated exotic woods, special-design tone circuits and pickups, and such features as gold-plated hardware. Active circuitry, a pickup mixing knob, and hand-rubbed and polished finishes are also included. Acoustic presented a complete line of bass amplification gear, including three bass amps with 120, 220, and 320 watts RMS of power and integral graphic equalizers. Two models have built-in electronic crossovers. Speaker cabinets, combination amp/ speaker units, and powered cabinets for bass, as well as PA mixers and cabinets, are also available. Gollehon showed its KS-2 Keyboard Speaker and P4 Penetrater PA Speaker ($349.00 and $799.00, respectively); each cabinet handles 300 watts of power. Both handle a wide range of frequencies (KS-2: 55Hz to 15kHz; P4: 40Hz to 20kHz), and are suitable for bass, guitar synthesizer, etc. The 3-way KS-2 has 15" and 10" speakers, while the P4 has a 15" speaker and a 10" midrange radial horn. Polytone unleashed its 240-watt RMS Pro Series Bass Amp ($795.00 with speaker system). The rack-mountable unit has two individual power amps, two pre-amps, and a crossover for biamping. Each channel has its own bass, treble, midrange, and volume controls, as well as a bright/ dark tone switch. 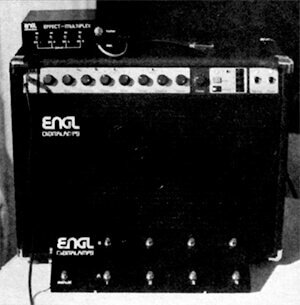 The Engl Digital Amp ($1,395.00) is a 100-watt RMS tube-circuit guitar amp with a memory designed to hold eight presets. A footpedal unit lets the player call up any of eight programs, each remembering settings for tone, gain, overdrive, reverb, and volume. The master volume operates independently, and memories can be tamper-proofed by locking the unit with a key. Control settings can be checked by turning a knob, and when an LED above it lights, then the setting duplicates that of the one in storage. An effect multiplexer lets the guitarist use four effects loops. 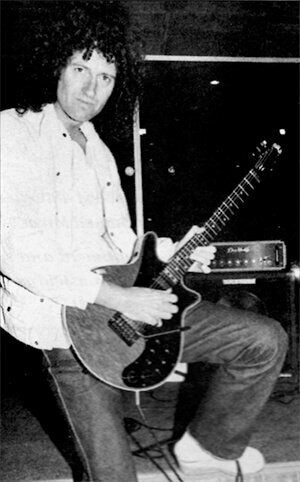 Brian May demonstrates his Guild Brian May model solid-body electric and DiMarzio's BHM pickups. The hum buckers are sold in pairs ($ 100.00 per set), and are potted in an anti-squeal compound. 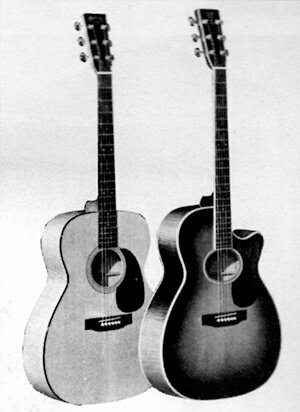 Martin Maple acoustics include Jumbo (J-65M and J 12-65M) and Auditorium (M-64 and MC-68) sizes. Features include gold-plated tuning machines, scalloped bracing, ebony fingerboards, and tortoiseshell-style binding. The cast aluminum Brunet MetalMaster electric guitar is designed for bright sustain and comes with a 22-fret rosewood fingerboard, DiMarzio MegaDrive pickup with master volume control, and a choice of colors. Options: Kahler locking tremolo, a pair of humbuckers or two single-coils, and an ebony fingerboard. Sperzel's Trim-Lok tuning machines have rear-mounted locking knobs that adjust each machine to hold the strings like a locking nut. Graduated post heights also eliminate the need for string trees. Digicomp's AIM Harmonic Modifier 9500 ($319.95) combines distortion, compression, and noise gating into a single unit. Compression levels, mixing of even and odd harmonics, and noise gate sensitivity and decay can be independently controlled. A footpedal version is available for $299.95, and another footpedal with the same functions, but fewer controls, costs $139.95. Tascam introduced its Studio 8, a combination of an 8-Track I / 4" reel-to-reel recorder with an 8-channel mixer in an integrated $3,495.00 unit. Each mixer channel has a 3-band parametric equalizer and jacks for interconnection with outboard sound enhancers, while the recorder section features dbx noise reduction and a return-to-zero search function. Rane's $349.00 ME 30 and S359.00 ME 15 MicroGraphic equalizers are single-channel 30-band and dual-channel 15-band equalizers, respectively. Features: range switches for selection of +6dB and 12dB of boost and cut per band, bypass switches, and a level control for each channel; each unit is single rack height (13/4"). Morley's SLMC-4 Slimline Multi Channel Volume Pedal (SI 79.95) has four discrete inputs and outputs, allowing for volume control over four separate signal paths. Optoelectronic circuitry eliminates pot noises. The SLMC-6, a $229.95 6-channel version of the SLMC-4, has a variable taper-control for adjusting the pedal response curve, and a minimum volume level control. Applied Research & Technology (ART) introduced its DR1 Digital Reverberation System, which is MIDI-controllable and features stereo inputs and outputs, as well as mixing provisions. It produces reverse and gated reverb effects, and allows for up to 100 user presets. Technical Projects' Active DI Splitter interface between electric guitars or basses and PA or recording gear. It requires external (phantom) power or a single 9-volt battery, and has ground compensation circuitry that automatically eliminates ground loops without a manual ground-lift switch. Publison showed its Infernal Machine 90, a $10,000.00 digital effects device that stores 150 programs. It has two independent digital reverbs, two pitch-shifting channels, and a memory that holds up to five minutes of sound samples. It also produces time expansion and compression, which lets you speed up or slow down musical passages while retaining the original pitch. Kustom launched a new line of powered PA mixers and cabinets. From four to eight inputs are included on units producing 130 watts RMS (some are stereo, with that much power per channel). Graphic equalizers, power level indicators, reverb, and EQ controls are included; the prod ucts range from S300.00 to $ I ,250.00. Sound reinforcement cabinets and monitors of various sizes range in price from $150.00 to $450.00. 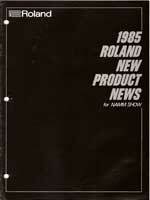 Suzuki introduced several rack-mountable signal processors and a 4-channel cassette recorder. There's a digital delay sampler, a digital delay, a dual reverb, a preamp, a dual compressor/ limiter, and a stereo power amp. The MR-I multi-track cassette recorder has six input channels, each with a limiter and independent track assignment switching. Other features: a chrome/ normal tape selector, pitch control, and dbx noise reduction. Available in a variety of lengths, Dean Markley Long Life Cables feature a 4-way strain relief, shrink-wrap coatings over the cord/ plug connection and over each soldered connection, and a special coating designed to virtually eliminate cord noises. The ground wire shield has 81 individually braided copper wires, which provide 95% of the total shielding. Zion's $1, 195.00 Scepter bass features frets, a Kahler tremolo, a single Bartolini Humbucking pickup, and chrome-plated hardware, as well as an offset body shape. It has a graphite neck and comes in two finsits: jet black and pearl white. First-of-its-kind Aria 6-string bass was built for Andy West just in time for the NAMM show. It has a Modulus Graphite frets, and a specially built vibrato. Bottom: Petrillo Guitars' Semitar interchangeable bodies, each with its styling and electronics complement. The $1,200.00 instrument comes with units cost S 195.00 DiXfarzio DLX-1 pickups photo shous unique knurled tuning knobs. Intended to make learning the guitar easy and fun, The Frets Connection ($39.95) from Glemming Enterprises is a box that attaches to neck of a guitar and automatically frets the correct notes of any of eight chords when you depress a button. Allen Products' Axrac Display System is available in several formats, all designed to hold electric or acoustic guitars horizontally for display and storage. Up to 10 instruments can be held by the $295.00 model (which has a stand with a central shaft on which the guitars are held), while a single unit for wall mounting costs $29.95. Mounts for left or right facing are available. Designed for use with all acoustic instruments, the Super-Sensitive Pickup/ Sensor ($39.95) mounts with a non-marring adhesive and requires no preamp for plugging directly into an amp, recorder, etc. It comes with a strain relief, adapter, and instructions. C-Tape Developments' C-Ducer Gigster ($99.95) is a flexible contact microphone that mounts directly on the top of an acoustic guitar. Its frequency range is 25Hz to 50kHz and it works with a battery-powered preamp for recording and amplification and has a belt clip and a volume control. A transducer consisting of a highly flexible piezoelectric wafer, as well as a specially designed preamp, are included in Passac's acoustic guitar pickup system. The pickup portion mounts inside the body and uses an endpin jack for an output. The preamp is external, and has filters optimized to the frequencies inherent in a guitar. Its controls set resonance and balance, as well as tone and volume. Gibson's SORS (Symbiotic Oriented Receptor System) is an acoustic guitar pickup with matching circuitry; controls for bass, treble, and volume are included. The bridge saddle pickup employs al 1000" - thick piezoelectric polymer film that's sensitive to frequencies from 100 seconds per cycle to 10 000 000 Hz—tremendously far bevond the range of hearing. The Cradle, from Music Rest, is a transparent holder for acoustic guitars that securely holds the instrument at playing height. The $159.00 holder has a chrome-plated, height - and angle-adjustable folding tripod base. Hardy Technologies' MS-1000 HR high mike stand ($64.95) adjusts from 54" to 87" for distant ambience miking in recording or PA applications. The folding stand is made of solid steel with nonskid rubber feet.